Livingston was incorporated as a township by an act of the New Jersey Legislature on February 5, 1813, from portions of Caldwell Township (now Fairfield Township) and Springfield Township (now in Union County, New Jersey). Portions of the township were taken to form Fairmount (March 11, 1862, now part of West Orange) and Roseland (March 10, 1908). The township was named for William Livingston, the first Governor of New Jersey; his family's coat of arms served as the township's seal for many years. In 2017, the Township of Livingston adopted a new logo, which appears on the Township website. Livingston's history dates back to 1699 when 101 Newark settlers wanted to move westward. They set up a committee to negotiate from Lenni Lenape Native Americans for the purchase of the Horseneck Tract which today includes Livingston and eight other northern municipalities. Between 1698 and 1702, the rules for property ownership were unclear. There were many disputes between settlers and the English proprietors. For some unknown reasons, the Newark settlers did not obtain a grant from the proprietors before negotiating with the natives. They finally obtained the deed directly from Lenni Lenape in 1702 for £130. The settlements began until around the 1740s as the dispute between the proprietors and the settlers continued. The dispute came to a breaking point in September 1745 when the East Jersey proprietors began to evict a settler only six months after a house fire in Newark completely destroyed the original deed, which was the only evidence of the purchase. During that period, William Livingston who was one of the few landed aristocrats joined the settlers against the proprietors. Livingston owned land around today's south western corner of the Township of Livingston. His land, like other settlers, was levied with quit rents in the amount 40 shillings per acre. He defended many settlers who were jailed for refusing to pay the quit rents. This series of events caused the settlers, led by Timothy Meeker, to form a group to riot against the British government. The Horseneck Riots lasted for 10 years from 1745 to 1755. The group was also one of the first colonial militia which had periodic battles for 32 years leading up to the Revolutionary War as the group joined the Continental Army in 1776. After the Revolutionary War, more permanent settlements took place with the first school built in 1783. In 1811, a petition was filed to incorporate the township from about 100 people who lived in seven distinct areas: Centerville (separated to become Roseland, in 1908), Cheapside (now Livingston Mall), Morehousetown (now Livingston Circle), Northfield (now Northfield Center), Squiretown (now the Cerebral Palsy Institute of New Jersey on Old Road), Teedtown (now Livingston Center), and Washington Place (now near the border with Millburn). On February 5, 1813, the township was officially incorporated. The first town meeting was held on the same day and they decided to run the township by a Township Committee system. During the 1800s, lumber and farming were major industries in the town. Shoemaking and dairy farming became major industries during and after the Civil War. However, the population grew slowly because it was not easily accessible. Mt. Pleasant Avenue – which was one of the first turnpikes in New Jersey – was the only primary access to the town through stagecoaches. The population grew quickly after the 1920s when automobiles became more accessible. As a suburb of Newark, the town experienced many housing developments especially after World War II with its peak in 1970 of more than thirty thousand residents. During this growth period, many services were organized including volunteer Fire Department in 1922, first regular Livingston Police Department chief in 1929, a Planning Commission in 1930, two hospitals opened in 1959 and 1960, new public library in 1961, and new municipal complex in 1963. The last surviving Harrison Cider Apple tree, the most famous of the 18th century Newark cider apples was rescued from extinction in 1976 in Livingston. Today, around 29,000 people live in this suburban community, which lies around an hour from New York City. Its school system, which had last been nationally recognized in 1998, and other programs have been drawing new residents to the town. Its population has maintained a level of diversity while the residents continue the tradition of community volunteerism. According to the United States Census Bureau, the Township of Livingston had a total area of 14.081 square miles (36.472 km2), including 13.768 square miles (35.660 km2) as land and 0.313 square miles (0.812 km2) as water. Livingston is in the New York metropolitan area. It is in southwestern Essex County. Within Essex County it is bordered by Roseland to the north, West Orange to the east, and Millburn/Short Hills to the south. To the west it is bordered by Morris County communities Florham Park and East Hanover. The western border is the Passaic River. Localities and place names located partially or completely within the township include Cedar Ridge, Cheapside, Morehousetown, Northfield, Washington Place and West Livingston. According to the 2002 results of the National Jewish Population Survey, there were 12,600 Jews in Livingston, approximately 46% of the population, one of the highest percentages of Jews in any American municipality. The neighboring towns of South Orange and Millburn also have high Jewish populations. In a report performed by the United Way of Northern New Jersey based on 2012 data, around 14% of Livingston households were classified as "Asset Limited, Income Constrained, Employed" households (below a threshold of $50,000 for households below 65, below $35,000 for those over 65), struggling with basic necessities, such as housing, childcare, food, health care, and transportation, compared to 38% statewide and 47% in Essex County. As of the 2010 United States Census, there were 29,366 people, 9,990 households, and 8,271.720 families residing in the township. The population density was 2,132.8 per square mile (823.5/km2). There were 10,284 housing units at an average density of 746.9 per square mile (288.4/km2). The racial makeup of the township was 76.17% (22,367) White, 2.26% (663) Black or African American, 0.07% (20) Native American, 19.21% (5,642) Asian, 0.02% (5) Pacific Islander, 0.86% (254) from other races, and 1.41% (415) from two or more races. Hispanic or Latino of any race were 4.06% (1,192) of the population. There were 9,990 households out of which 41.5% had children under the age of 18 living with them, 73.5% were married couples living together, 6.8% had a female householder with no husband present, and 17.2% were non-families. 15.2% of all households were made up of individuals, and 10.3% had someone living alone who was 65 years of age or older. The average household size was 2.91 and the average family size was 3.24. In the township, the population was spread out with 27.0% under the age of 18, 4.7% from 18 to 24, 21.2% from 25 to 44, 30.3% from 45 to 64, and 16.8% who were 65 years of age or older. The median age was 43.3 years. For every 100 females there were 94.6 males. For every 100 females ages 18 and older there were 90.1 males. The Census Bureau's 2006–2010 American Community Survey showed that (in 2010 inflation-adjusted dollars) median household income was $129,208 (with a margin of error of +/- $6,377) and the median family income was $143,429 (+/- $10,622). Males had a median income of $100,075 (+/-$11,306) versus $71,213 (+/- $7,102) for females. The per capita income for the township was $60,577 (+/- $3,918). About 1.1% of families and 2.3% of the population were below the poverty line, including 0.6% of those under age 18 and 1.7% of those age 65 or over. As of the 2000 United States Census there were 27,391 people, 9,300 households, and 7,932 families residing in the town. The population density was 1,973.1 people per square mile (761.9/km2). There were 9,457 housing units at an average density of 681.2 per square mile (263.1/km2). The racial makeup of the township was 82.64% White, 14.54% Asian, 1.20% African American, 0.05% Native American, 0.01% Pacific Islander, 0.69% from other races, and 0.87% from two or more races. Hispanic or Latino of any race were 2.54% of the population. There were 9,300 households out of which 41.8% had children under the age of 18 living with them, 76.0% were married couples living together, 7.0% had a female householder with no husband present, and 14.7% were non-families. 13.0% of all households were made up of individuals and 8.4% had someone living alone who was 65 years of age or older. The average household size was 2.93 and the average family size was 3.21. In the township the age distribution of the population shows 26.6% under the age of 18, 4.6% from 18 to 24, 26.6% from 25 to 44, 26.8% from 45 to 64, and 15.4% who were 65 years of age or older. The median age was 41 years. For every 100 females, there were 94.7 males. For every 100 females age 18 and over, there were 90.3 males. The median income for a household in the township was $98,869, and the median income for a family was $108,049. Males had a median income of $77,256 versus $41,654 for females. The per capita income for the town was $47,218. 1.8% of the population and 1.1% of families were below the poverty line. Out of the total people living in poverty, 1.2% are under the age of 18 and 3.2% are 65 or older. Although largely a bedroom community, there are many stores and restaurants located in Livingston, in three main shopping areas. The first area is located in the center of the town. It stretches along Livingston Avenue from Route 10 to Northfield Avenue. Historically, the area has been dominated by small local stores, but retains some chain stores including Starbucks, Dunkin' Donuts, and ShopRite. With the addition of Livingston Town Center, classified as mixed-use development, new restaurants have opened as well, adding to the large number of locally owned establishments. The second area is the Livingston Mall located at the south-western corner of the town. Macy's, Lord & Taylor and Sears department stores are anchors in the original three wings of the mall. The fourth wing, added in 2008, is home of Barnes & Noble. The third shopping area begins the Route 10 shopping corridor that extends to East Hanover. It includes Rt 10 Farmer's Market. Many office parks are located along Eisenhower Parkway on the western side of the town. There are a few headquarters of major companies including former CIT Group corporate headquarters, Inteplast Group headquarters, The Briad Group headquarters, and customer service and support center of Verizon New Jersey. There are varieties of other services in the town. The Westminster is located on the western side of the town. There is no sidewalk access to other businesses so alternative modes of transportation should be considered if looking to dine in the area. Saint Barnabas Medical Center – a 597-bed hospital – is located in the southern side of the town near West Orange and Millburn. Fitness facilities include West Essex YMCA and New York Sports Club. A Jewish Community Center with fitness center also exists just over the border in West Orange. Livingston also has a local Public-access television station (Livingston TV on Comcast TV-34 and Verizon FiOS 26), which is maintained by Livingston High School Students as well as the LPBC (Livingston Public Broadcasting Committee). Livingston Symphony Orchestra is a group of community-based performers which was formed in 1960. The symphony orchestra is currently directed by Istvan Jaray, an internationally renowned artist who appears regularly in concert halls across Europe, Canada and the United States. It holds many performances during each season. Livingston Community Players is a community-based theatre organization. There has been many productions in the recent years. The performers are from local community and other places in New Jersey. Past productions, including The Sound of Music, Oliver!, and Annie, received Perry Awards from New Jersey Association of Community Theatres. Children's Theatre of Livingston is a local organization that provides performance opportunities for Livingston children grades 2 to 8. The children are trained in acting roles and staging staff. It has annual performance since the first season in 2007. New Jersey Ballet is a major ballet company based in Livingston. The company is recognized nationally and internationally with tours in many countries in Europe, Asia and North America. Livingston is also the headquarters of New Jersey School of Ballet which offers many classes in Ballet, Jazz and Tap. Livingston has many local artists in varied forms. Local artists have support from Livingston Arts Association which is an organization formed in 1959 to promote art in the community including large scale exhibitions, demonstrations, and workshops. The organization is also a member of Art Council of Livingston which has a gallery at Livingston Town Center. The Arts Association includes numerous organizations in addition to the Arts Council of Livingston, including the NJ State Opera Guild – West Essex Chapter and Livingston Camera Club. There are many studios at Riker Hill Art Park with more than 40 working artists in various media including pottery, fine metalwork, glass, jewelry, paintings, fine arts, sculpture and photography. Many studios offer art classes for adults and children. From 1984 to 1989, Livingston was the site of the Grand Prix tennis circuit tournament, the Livingston Open, held at Newark Academy. The Grand Prix was the only professional circuit since 1985 before it was succeeded by the ATP Tour in 1990. The tournament was won by Andre Agassi in 1988, earning him the seventh title in his career. There are more than 470 acres (1.9 km2) of wooded parks with passive hiking trails in Livingston. Additional 1,817 acres (7.35 km2) are zoned to be preserved in its natural state without public access. This brings to about 25% of total land in the town that is in its natural conditions with habitats of eight threatened or endangered species. There are many smaller parks and open space areas dedicated to recreation and sports, mostly centered around the town's public schools. These include two swimming pools, ten little league baseball diamonds, four full baseball diamonds, eight full soccer/lacrosse fields, one full football field, three basketball courts, sixteen tennis courts, eleven playgrounds, a jogging track, a dog park, and a fishing/ice skating pond. The township is planning to build inter-connected mixed-use paths, biking and hiking trails to connect those parks and open space throughout the township. Livingston has an active open space trust fund that continues to acquire more lands for preservation and recreation. As of 2003[update], there were 842 acres (9% of total land) that were protected from development. There were additional 2,475 acres (10.02 km2) that could be protected by the fund. Riker Hill Complex (also referred to as Riker Hill Art Park) is a 204.68-acre (0.8283 km2) parkland located along the border of Livingston and Roseland. The complex is managed by Department of Parks, Recreation, and Cultural Affairs of Essex County. It comprises three parks, Riker Hill Art Park – a former Nike Missile control area site, Walter Kidde Dinosaur Park – a National Natural Landmark, and Becker Park which were acquired between 1969 and 1977. Although a large portion of the complex is located within Roseland, but the county designated Livingston as the host community as the Riker Hill Art Park is the only functional and publicly accessible park at the present time. The art park located atop of the hill is home of many studios in multiple disciplines of art and craft. The recreation department under the Senior, Youth and Leisure Services program offers many programs for residents ranging from pre-school courses, children games, crafts, and dance; to a dozen of youth and adult sports programs. There are many independent sports organizations such as Livingston Little League, Livingston Jr. Lancers (football and cheerleading), Livingston Lacrosse Club, and Livingston Soccer Club. Livingston has operated since 1957 within the Faulkner Act, formally known as the Optional Municipal Charter Law, under the Council-Manager form of municipal government. Livingston's Township Council consists of five members, elected to four-year terms of office on a staggered basis, with either two or three seats coming up for election every other year. A Mayor and Deputy Mayor are selected by the Council from among its members at a reorganization meeting held after each election. The mnembers of the Township Council as of 2019[update] are Mayor Alfred "Al" M. Anthony (D, term as Mayor ends December 31, 2019; term on council ends 2020), Edward Meinhardt (D, term on council ends 2022), Deputy Mayor Rufino "Rudy" Fernandez (D, term as Deputy Mayor ends December 31, 2019; term on council ends 2022), Shawn R. Klein (D, term on council ends 2022). The Township Manager is Barry R. Lewis Jr., whose tenure began on March 1, 2018. The previous Township Managers were Robert H. Harp (1954–1985), Charles J. Tahaney (1985–2005), and Michele E. Meade (2005–2016). Gregory J. Bonin served for a single week in 2017 before resigning, and Deputy Township Manager Russell A. Jones Jr. served as Acting Township Manager for the rest of the interval between Meade and Lewis. The Livingston Police Department (LPD) was established in 1813. It consists of the following divisions: Patrol, Traffic, Communications (911 dispatch), Police Records, Internal Affairs, and Community Policing. Bureaus include the Detective and Juvenile bureaus. There are more than 40 volunteer Committees and Boards run through the Township, including Livingston Municipal Alliance Committee (LMAC), Holiday Committees, Consumer Affairs Office, Planning Board, Zoning Board of Adjustment, and Committee for Diversity & Inclusion. Volunteer-based public safety organizations are Livingston Auxiliary Police, Livingston Fire Department and Livingston First Aid Squad. Livingston is located in the 11th Congressional District and is part of New Jersey's 27th state legislative district. Prior to the 2010 Census, Livingston had been split between the 8th Congressional District and the 11th Congressional District, a change made by the New Jersey Redistricting Commission that took effect in January 2013, based on the results of the November 2012 general elections. As of March 23, 2011, there were a total of 20,617 registered voters in Livingston, of which 7,640 (37.1%) were registered as Democrats, 3,564 (17.3%) were registered as Republicans and 9,402 (45.6%) were registered as Unaffiliated. There were 11 voters registered to other parties. In the 2016 presidential election, Democrat Hillary Clinton received 60.8% of the vote (9,052 cast), ahead of Republican Donald Trump with 36.8% (5,475 votes), and other candidates with 2.5% (367 votes), among the 15,235 ballots cast by the township's 22,664 registered voters (341 ballots were spoiled), for a turnout of 67.2%. In the 2012 presidential election, Democrat Barack Obama received 51.1% of the vote (7,303 cast), ahead of Republican Mitt Romney with 48.1% (6,863 votes), and other candidates with 0.8% (116 votes), among the 14,371 ballots cast by the township's 21,225 registered voters (89 ballots were spoiled), for a turnout of 67.7%. In the 2008 presidential election, Democrat Barack Obama received 53.4% of the vote here (8,244 cast), ahead of Republican John McCain with 44.8% (6,920 votes) and other candidates with 0.8% (122 votes), among the 15,433 ballots cast by the township's 20,367 registered voters, for a turnout of 75.8%. In the 2017 gubernatorial election, Democrat Phil Murphy received 61.2% of the vote (4,671 cast), ahead of Republican Kim Guadagno with 37.6% (2,872 votes), and other candidates with 1.2% (95 votes), among the 7,722 ballots cast by the township's 22,280 registered voters (84 ballots were spoiled), for a turnout of 34.7%. In the 2013 gubernatorial election, Republican Chris Christie received 62.7% of the vote (4,860 cast), ahead of Democrat Barbara Buono with 36.1% (2,799 votes), and other candidates with 1.1% (89 votes), among the 7,905 ballots cast by the township's 21,260 registered voters (157 ballots were spoiled), for a turnout of 37.2%. In the 2009 gubernatorial election, Republican Chris Christie received 48.8% of the vote here (4,863 ballots cast), ahead of Democrat Jon Corzine with 44.0% (4,386 votes), Independent Chris Daggett with 5.7% (563 votes) and other candidates with 0.6% (61 votes), among the 9,961 ballots cast by the township's 20,405 registered voters, yielding a 48.8% turnout. Livingston was the home of one of New Jersey's most prominent political families, the Keans. Robert Kean served in the U.S. House of Representatives from 1939 to 1958, when he ran for U.S. Senator; his son, Thomas Kean, who served in the New Jersey General Assembly from 1968 to 1978 (and as Assembly Speaker in 1972–73, and Minority Leader 1974–77), as Governor of New Jersey from 1982 to 1990, and as President of Drew University from 1990 to 2004. Thomas Kean Jr., elected to the State Assembly in 2001 and the State Senate in 2003, was the Republican nominee for United States Senator in 2006. When Robert Kean ran for the Senate, losing to Harrison A. Williams in 1958, Livingston's Congressman became George M. Wallhauser, a Republican. In redistricting after the 1960 census, Livingston was moved into the district of Republican Congresswoman Florence P. Dwyer. After redistricting following the 1970 census, Livingston went into Congressman Peter Frelinghuysen Jr.'s district. He was the father of Livingston's current Congressman, Rodney P. Frelinghuysen. When Peter Frelinghuysen retired in 1974, he was succeeded by Millicent Fenwick, who beat Tom Kean in a Republican primary by about 80 votes. After the 1980 census, Livingston was moved to Congressman Joseph G. Minish's district. Minish was defeated by Dean Gallo in 1984 and served until his death in 1994. Rodney Frelinghuysen took his seat. The 2000 Census split the town between the 8th and 11th districts; as of the 2010 Census, the entire township is in the 11th district. The Livingston Public Schools serves students in pre-kindergarten through twelfth grade. As of the 2015-16 school year, the district's nine schools had an enrollment of 5,984 students and 471.7 classroom teachers (on an FTE basis), for a student–teacher ratio of 12.7:1. Schools in the district (with 2015-16 enrollment data from the National Center for Education Statistics) are Burnet Hill Elementary School (449 students in grades PreK-5), Collins Elementary School (472; K-5), Harrison Elementary School (474; K-5), Hillside Elementary School (398; K-5), Mount Pleasant Elementary School (453; K-5), Riker Hill Elementary School (495; K-5), Mount Pleasant Middle School Grade 6 (364), Heritage Middle School Grades 7 and 8 (962) and Livingston High School (1,832; 9-12). For the 1997–98 school year, Livingston High School received the National Blue Ribbon Schools Award from the United States Department of Education, one of the highest honors that an American school can achieve. Livingston High School was ranked 24th in New Jersey in New Jersey Monthly's 2012 rankings, 9th in New Jersey high schools in Newsweek's 2013 rankings of "America's Best High Schools", and is unranked in USNews's high school rankings. 26.7% of the township's population 25 years and older who attain professional, Masters or Doctorate degrees. During 2007–2008 budget year, Livingston allocated 59.96% of local property tax toward the Livingston Public Schools. Additionally, a separate budget of 7% of all municipal services went toward the operation of its public library. According to library statistics collected by Institute of Museum and Library Services, Livingston Public Library was ranked 22 out of 232 municipal libraries in New Jersey based on total circulation in 2006. Aquinas Academy is a private coeducational Roman Catholic school that serves students from preschool through eighth grade that operates under the auspices of the Roman Catholic Archdiocese of Newark. Joseph Kushner Hebrew Academy is a private coeducational Jewish day school that serves preschool through eighth grade, while Rae Kushner Yeshiva High School is a four-year yeshiva high school for grades 9–12. The Tzedek School is a non-sectarian co-educational school of Jewish Heritage and Hebrew Language serving the communities of Livingston and the surrounding area for students in grades K-12. Newark Academy is a private coeducational day school founded in 1774, that serves grades 6–8 in its middle schools and 9–12 in the upper school. Livingston Chinese School and Livingston Huaxia Chinese School are two weekend Chinese-language schools in Livingston which use facilities of Heritage Middle School and Mount Pleasant school. Christian Evangelical Church In Livingston (Chinese), Old Road. Livingston United Methodist Church, W. Hobart Gap Rd. Ward-Force House and Condit Family Cook House are two building structures located at 366 South Livingston Avenue. These structures were jointly registered in the National Register of Historic Places in 1981, commonly known as the Old Force Homestead. Originally, Ward-Force House and Condit Family Cook House were built in separate properties. Ward-Force House was built as early as 1745 by Theophilus Ward. It was later purchased by Samuel Force for his son, Thomas Force. During the Revolutionary War, Thomas served as a patriot and was captured by the British. Thomas came back to live with his wife and children after the war and expanded the house. It was sold to the township in 1962. Condit Family Cook House was built as a stand-alone summer kitchen of a farm home near the current location of Livingston Mall. When the mall was built during the 1970s, the cook house was donated to the township and was moved to the current location at the rear of Ward-Force House. Currently, the Old Force Homestead is the headquarters of Livingston Historical Society and the Force Homestead Museum. Dickinson House and Washington Place Schoolhouse are two other sites in the township that are registered in the New Jersey State Historic Site Program. Dickinson House is located at 84 Dickinson Lane. It was once visited by U.S. President Theodore Roosevelt for a hunting trip. Washington Place Schoolhouse is located at 122 Passaic Avenue. It was a school house that was built around 1800. Livingston is located 21.9 miles (35.2 km) from New York City, around 40-90+ minutes depending on traffic. Roads serving Livingston include Eisenhower Parkway, County Route 508, County Route 527, Interstate 280 and Route 10. The township had a total of 136.05 miles (218.95 km) of roadways, of which 105.43 miles (169.67 km) are maintained by the municipality, 26.05 miles (41.92 km) by Essex County and 4.57 miles (7.35 km) by the New Jersey Department of Transportation. Rail service is accessible via the NJ Transit Morristown Line, which has several stops in adjacent communities such as Short Hills, Millburn, and South Orange. The stations are about 5–7 miles away from most of Livingston, accessible by car or taxi. The township provides a fee-based direct shuttle service called Livingston Express Shuttle for a 15-minute ride between Livingston Mall and South Orange Station for Morristown Line trains to Midtown Manhattan and Hoboken. Amtrak's Northeast Corridor, for inter-city rail transit in the Northeastern United States, and the Port Authority's PATH service local rapid transit system are available 10 miles away at Newark Penn Station. On May 22, 1992, Democratic Presidential candidate and eventual Presidential elect Bill Clinton visited Livingston High School on a campaign stop to announce his support for Governor James Florio's NJ welfare proposal. On June 18, 1996, the Olympic Torch made a stop in Livingston while en route to Atlanta, Georgia. On November 16, 1999, Livingston High School hosted sitting Governor Christine Todd Whitman and her cabinet for a town meeting with a conversation focusing on the state's diversity. On January 13, 2008, Livingston High School hosted a crowd of 900 at the first of New Jersey Governor Jon Corzine's all-state county forum tour of Jersey to promote and explain his new toll hike proposal to finance state road maintenance. The town hall meeting featured a PowerPoint by Corzine and then a Q and A session where many attendees inquired about a new school financing proposal more so than the toll issue. On June 30, 2015, Chris Christie launched his campaign for the 2016 Republican presidential nomination at Livingston High School. See also: Category:People from Livingston, New Jersey. Shiva Ayyadurai (born 1963), MIT systems scientist and entrepreneur who developed an email system in 1979 when he was a student at Livingston High School. Paul E. Olsen (born 1953), paleontologist, elected to the United States National Academy of Sciences, helped in getting Riker Hill Fossil Site in Roseland registered as a National Natural Landmark when he was a teenager. Suzanne Steinbaum (born c. 1968), cardiologist and director of Women's Heart Health at the Heart and Vascular Institute at Lenox Hill Hospital. Roger Y. Tsien (1952–2016), chemist who was awarded the 2008 Nobel Prize in Chemistry. He also won first prize in the Westinghouse talent search at age 16 when he attended Livingston High School with a project investigating how metals bind to thiocyanate. Val Britton (born 1977), artist known for her collage work. Frank Biondi (born 1945), former President and CEO of Viacom, and former Chairman and CEO of Universal Studios. Robert E. Grady (born 1959), venture capitalist, investment banker and government official. Barry Halper (1939–2005), baseball memorabilia collector and businessman, who was once a limited partner in the Yankees' ownership with George Steinbrenner. Charles Kushner (born 1954), real estate mogul and Democratic fundraiser who pleaded guilty in 2004 to tax violations and charges related to witness tampering. Joshua Kushner (born 1985), businessman and investor. David Tepper (born 1957), founder of the hedge fund Appaloosa Management. Jason Alexander (born 1959, originally Jay Greenspan), actor best known for his role as George Costanza of the long-running television show, Seinfeld. Benjamin August (born c. 1979), casting director and screenwriter. Bruce Beck (born 1956), sportscaster on WNBC. Alan Cooper (born ca. 1949), founding member of Sha-Na-Na and biblical scholar. Rob Fusari (born c. 1968), music producer and songwriter who discovered Lady Gaga. Dana Gaier (born 1997), actress and singer-songwriter known for her role as "Edith" in the Despicable Me franchise. Chelsea Handler (born 1975), stand-up comedian, author, television personality and star of Chelsea Lately on E!. Heth and Jed, New York City-based indie rock duo consisting of brothers Heth and Jed Weinstein, who are also co-authors of Buskers: The On-the-Streets, In-the-Trains, Off-the-Grid Memoir of Two New York City Street Musicians (Soft Skull Press). Nikki M. James (born 1981), Tony-Award-winning actress and singer who won a 2011 Tony Award for Best Featured Actress in a musical for her role as Nabulungi in The Book of Mormon. Myq Kaplan (born 1978), comedian. Leslie Kritzer (born 1977), Broadway actress in Legally Blonde: The Musical, The Great American Trailer Park Musical, and A Catered Affair with Harvey Fierstein. Stephen Oremus (born 1971), music supervisor, music director, orchestrator and vocal arranger who won a 2011 Tony Award for Orchestration for The Book of Mormon. Adam Pally (born 1982), comedian and actor who appears in the ABC series Happy Endings. Richard Tanne (born 1985), filmmaker who wrote and directed Southside With You. Thea White (born 1953), voice actress, best known for her role as Muriel in Courage the Cowardly Dog. Wendy Williams (born 1964), radio personality, television host, actress, producer, author and comedian who has been host of The Wendy Williams Show. Danny Zuker (born 1963) Emmy award-winning writer and producer for Modern Family. Glenn K. Rieth (born 1957), who was the Adjutant General of New Jersey in Governor Jon Corzine's cabinet. Mona Charen (born 1957), conservative political columnist who grew up in Livingston, where she was close friends with future Washington Post journalist Ruth Marcus. Susie Fishbein (born 1968), Orthodox Jewish author of the best-selling Kosher By Design kosher cookbook series published by ArtScroll. Ariel Horn (born c. 1979), novelist and teacher. Jack Ketchum (pseudonym of Dallas Mayr, born 1946), author of The Girl Next Door and Off Season, who is a five-time winner of the Bram Stoker Award for Fiction. Ruth Marcus (born 1958), liberal op-ed columnist for The Washington Post who grew up in Livingston, where she was close friends with future political (and politically-opposite) columnist Mona Charen. Wendy Mass (born 1967), author of books for children, including A Mango-Shaped Space. Brendan Byrne (1924–2018), former Governor of New Jersey and Essex County Prosecutor, lived and died in Livingston. Christopher J. Christie (born 1962), Governor of New Jersey, a former United States Attorney for the United States District Court for the District of New Jersey who served on the Morris County Board of Chosen Freeholders. Lucille Davy, former Commissioner of the New Jersey Department of Education and a graduate of Livingston High School. Nathan L. Jacobs (1905–1989), Justice of the New Jersey Supreme Court in 1948 and from 1952 to 1975. The Keans: Hamilton Fish Kean (1862–1941, Congress 1929–1935), Robert Kean (1893–1980, Congress 1939–1950), Thomas Kean (Assembly 1968–78, Speaker 1971–72, Governor, 1982–90) and Tom Kean Jr. (Assemblyman 2001–03; State Senate 2003-date; 2006 G.O.P. failed nominee for U.S. Senate). Alan B. Krueger (born 1960), economist nominated to serve on the Council of Economic Advisers. Jared Kushner (born 1981), senior presidential adviser to Donald Trump. Mike Weinstein (born 1949), member of the Florida House of Representatives. Nina Mitchell Wells, former Secretary of State of New Jersey. Her husband, Ted Wells, is a prominent criminal attorney. David Wildstein (born 1961), former mayor of Livingston and central figure in the Bridgegate scandal. Jozy Altidore (born 1989), striker for the USA Senior Men's Soccer Team who plays for Toronto F.C. Tashawn Bower (born 1995), defensive end for the Minnesota Vikings of the National Football League (NFL). He played college football at LSU. Mike Chernoff (born c. 1981), baseball General Manager for the Cleveland Indians. Hazel Clark (born 1977), runner who represented the US at the Summer Olympics in 2000, 2004 and 2008 competing in the 800 metres event. Andrea Davidovich (born 1997), figure skater who represented Israel in the 2014 Winter Olympics. Bob Dukiet (1948–2009), college basketball coach. Monica Flores (born 1996), American-born Mexican footballer who plays as a left back for Notre Dame Fighting Irish and for the Mexico women's national team. Lennie Friedman (born 1976), NFL offensive lineman. Justin Gimelstob (born 1977), professional tennis player who won 13 doubles titles and reached 1 final in singles. Chris Jacobs (born 1964), swimming medalist at the 1988 Summer Olympics. Brian Jamieson (born 1969), rower who won a silver medal at the 1996 Summer Olympics in the quad scull event. Sheldon Karlin (1950–2000), distance runner who won the New York City Marathon in 1972. Dan Kellner (born 1976), Olympic foil fencer. Brandin Knight (born 1981), former professional basketball player. Brevin Knight (born 1975), professional basketball player on the Charlotte Bobcats. Connor Lade (born 1989), professional soccer player for the New York Red Bulls. Brendan Mahon (born 1995), guard for the Carolina Panthers of the NFL. Larry Ogunjobi (born 1994), defensive tackle for the Cleveland Browns. Deonna Purrazzo (born 1994), professional wrestler for World Wrestling Entertainment. Claudio Reyna (born 1973), professional soccer player who played for European premier teams and was on the World Cup squad from 1994 until 2006. Frank Schwindel (born 1992), first baseman for the Kansas City Royals. Byron Scott (born 1961), lived here while he was coach of the New Jersey Nets. David Tyree (born 1980), NFL wide receiver who played for the Super Bowl XLII champion New York Giants. Richie Zisk (born 1949), who played for the Pittsburgh Pirates and other MLB teams. Ruggiero "Richie The Boot" Boiardo (1890–1984), alleged capo of the Genovese crime family and alleged notorious mafiosa of Newark, New Jersey in the early 1900s. ^ a b c Contact Us, Township of Livingston. Accessed January 6, 2018. ^ 2019 New Jersey Mayors Directory, New Jersey Department of Community Affairs. Accessed August 21, 2018. ^ a b Manager's Office, Township of Livingston. Accessed March 6, 2018. ^ Clerk's Office, Township of Livingston. Accessed March 6, 2018. ^ U.S. Geological Survey Geographic Names Information System: Township of Livingston, Geographic Names Information System. Accessed March 7, 2013. ^ a b c d e f DP-1 – Profile of General Population and Housing Characteristics: 2010 for Livingston township, Essex County, New Jersey, United States Census Bureau. Accessed December 31, 2011. ^ a b c Table DP-1. Profile of General Demographic Characteristics: 2010 for Livingston township, New Jersey Department of Labor and Workforce Development. Accessed December 31, 2011. ^ a b GCT-PH1 Population, Housing Units, Area, and Density: 2010 – State – County Subdivision from the 2010 Census Summary File 1 for New Jersey, United States Census Bureau. Accessed August 5, 2013. ^ Look Up a ZIP Code, United States Postal Service. Accessed August 29, 2011. ^ Area Code Lookup - NPA NXX for Livingston, NJ, Area-Codes.com. Accessed August 25, 2014. ^ a b Snyder, John P. The Story of New Jersey's Civil Boundaries: 1606–1968, Bureau of Geology and Topography; Trenton, New Jersey; 1969. p. 128. Accessed July 18, 2012. ^ a b c About Livingston Archived 2011-07-27 at the Wayback Machine. Accessed March 9, 2007. ^ Coxe, William Jr. A View of the Cultivation of Fruit Trees and the Management of Orchards and Cider, M. Carey and son, 1817. Accessed September 3, 2015. ^ McManus, Fran. "Lost & Found; The rise, fall and rebirth of the Harrison cider apple", Edible Jersey, Fall 2010. Accessed August 5, 2013. "In September 1976, Paul Gidez, an orchardist and fruit collector from Vermont, came to Essex County to search for the Harrison apple. Stopping at a bagel shop, he asked if there were any old cider mills in the area. He was directed to Nettie Ochs Cider Mill in Livingston, where he found a large Harrison tree that, according to the owner, had been planted around the turn of the century." ^ Livingston History, Township of Livingston. Accessed August 28, 2009. ^ Areas touching Livingston, MapIt. Accessed September 3, 2015. ^ Compendium of censuses 1726–1905: together with the tabulated returns of 1905, New Jersey Department of State, 1906. Accessed July 14, 2013. ^ Bowen, Francis. American Almanac and Repository of Useful Knowledge for the Year 1843, p. 231, David H. Williams, 1842. Accessed July 14, 2013. ^ Raum, John O. The History of New Jersey: From Its Earliest Settlement to the Present Time, Volume 1, p. 243-4, J. E. Potter and company, 1877. Accessed July 14, 2013. "Livingston was formed in 1812, is five miles long and four wide. On the north is Caldwell, on the east West Orange, on the west Chatham and Hanover, in Morris county, and on the south Millburn. It lies ten miles west of Newark, and contains the small settlements of Livingston, Centreville, Moorehoustown, and Northfield. Population in 1850, 1,151; in 1860, 1,323; and in 1870, 1,157." ^ Debow, James Dunwoody Brownson. The Seventh Census of the United States: 1850, p. 138. R. Armstrong, 1853. Accessed July 14, 2013. ^ Staff. A compendium of the ninth census, 1870, p. 259. United States Census Bureau, 1872. Accessed July 14, 2013. ^ Porter, Robert Percival. Preliminary Results as Contained in the Eleventh Census Bulletins: Volume III – 51 to 75, p. 98. United States Census Bureau, 1890. Accessed July 18, 2012. ^ Thirteenth Census of the United States, 1910: Population by Counties and Minor Civil Divisions, 1910, 1900, 1890, United States Census Bureau, p. 336. Accessed July 18, 2012. ^ Fifteenth Census of the United States : 1930 – Population Volume I, United States Census Bureau, p. 716. Accessed December 5, 2011. ^ a b c d e Census 2000 Profiles of Demographic / Social / Economic / Housing Characteristics for Livingston township, Essex County, New Jersey, United States Census Bureau. Accessed July 18, 2012. ^ a b c d e DP-1: Profile of General Demographic Characteristics: 2000 – Census 2000 Summary File 1 (SF 1) 100-Percent Data for Livingston township, Essex County, New Jersey, United States Census Bureau. Accessed July 18, 2012. ^ Jewish Population in the United States, 2002, National Jewish Population Survey. Accessed May 11, 2006. ^ "ALICE Asset Limited, Income Constrained, Employed: Study of Financial Hardship", United Way of Northern New Jersey, September 2014. Accessed September 18, 2014. "In total, 1.2 million households in New Jersey – fully 38 percent – struggled to support themselves in 2012." ^ DP03: Selected Economic Characteristics from the 2006–2010 American Community Survey 5-Year Estimates for Livingston township, Essex County, New Jersey, United States Census Bureau. Accessed December 31, 2011. ^ Store Directory, Livingston Town Center. Accessed April 16, 2009. ^ Verizon to Open New Customer Service and Support Center in Livingston, N.J., Reuters, February 17, 2009. Accessed April 16, 2009. ^ Location, The Westminster Hotel. Accessed April 16, 2009. ^ "A proud half-century for symphony", The Star-Ledger, October 12, 2006. Accessed August 16, 2009. ^ Livingston Community Players, New Jersey Association of Community Theatres. Accessed March 10, 2013. ^ Mission Statement, Children's Theatre of Livingston. Accessed August 16, 2009. ^ About Us, New Jersey Ballet. Accessed August 5, 2013. ^ About the School, New Jersey School of Ballet. Accessed August 5, 2013. ^ About Us, Livingston Arts Association. Accessed August 5, 2013. ^ Riker Hill Art Park for Artists at Work Open House. Accessed August 16, 2009. ^ Livingston, NJ, U.S.A. August 07 - 13 1989, ATP World Tour. Accessed July 8, 2015. As of date accessed, results are listed for 1998–2014 from another tournament under past champions. 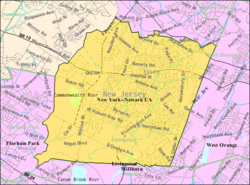 ^ Zoning Map, Livingston Township. Accessed April 16, 2009. ^ a b Trails And Greenways Plan for Township of Livingston County of Essex, Morris Land Conservancy, July 2007. Accessed November 18, 2009. ^ Open Space And Recreation Plan For the Township of Livingston County of Essex, Morris Land Conservancy, February 2003, p. 12. Accessed November 18, 2009. ^ Riker Hill Complex, Essex County Parks. Accessed on March 27, 2009. ^ Recreation Department Fall 2009, Township of Livingston. Accessed November 18, 2009. ^ Golf for Livingston Residents, Livingston Recreation Department. Accessed April 16, 2009. ^ Livingston Municipal Government, Township of Livingston. Accessed February 22, 2012. ^ Council-Manager Government, Township of Livingston. Accessed May 11, 2016. ^ Township Council Members, Township of Livingston. Accessed January 6, 2018. ^ Santola, Danielle. "The Search is Over: Livingston Welcomes New Township Manager", TAP into Livingston, January 30, 2018. Accessed March 6, 2018. "After being vacant for several months, the position of Livingston Township Manager has been officially filled by Barry Lewis, Jr., who will begin full time on March 1." ^ Staff. "Town Council Votes Unanimously to Appoint Gregory J. Bonin as New Township Manager", West Essex Tribune, July 13, 2017. Accessed August 15, 2017. "The Livingston Township Council, at its meeting on Monday evening, July 11, officially appointed Gregory J. Bonin to the position of township manager." ^ Staff. "New Livingston Township Manager Resigns After One Week in Service", TAP into Livingston, August 16, 2017. "Following Monday's meeting of the Livingston Township Council, newly appointed Township Manager Greg Bonin announced his resignation, effective immediately. According to Livingston Mayor Shawn Klein, Bonin apologized in his letter of resignation, stating that he felt that he would be unable to commit his heart and soul to the level he felt the township deserves." ^ Santola, Danielle. "Livingston's Russ Jones Honored for 45 Years of Service", TAP into Livingston, July 11, 2017. Accessed March 6, 2018. ^ Staff. "New Livingston Township Manager Resigns After One Week in Service", TAP into Livingston, August 16, 2017. Accessed March 6, 2018. "Following Monday's meeting of the Livingston Township Council, newly appointed Township Manager Greg Bonin announced his resignation, effective immediately." ^ Boards & Committees, Township of Livingston. Accessed August 25, 2014. ^ "Presidential General Election Results - November 8, 2016 - Essex County" (PDF). New Jersey Department of Elections. December 14, 2016. Retrieved January 6, 2018. ^ "Number of Registered Voters and Ballots Cast - November 8, 2016 - General Election Results - Essex County" (PDF). New Jersey Department of Elections. December 21, 2016. Retrieved January 6, 2018. ^ "Governor – Bergen County" (PDF). New Jersey Department of Elections. December 21, 2017. Retrieved December 22, 2017. ^ "Number of Registered Voters and Ballots Cast - November 7, 2017 - General Election Results - Bergen County" (PDF). New Jersey Department of Elections. December 21, 2017. Retrieved December 22, 2017. ^ District information for Livingston School District, National Center for Education Statistics. Accessed November 14, 2018. ^ School Data for the Livingston Public Schools, National Center for Education Statistics. Accessed November 14, 2018. ^ Burnet Hill Elementary School, Livingston Public Schools. Accessed November 14, 2018. ^ Collins Elementary School, Livingston Public Schools. Accessed November 14, 2018. ^ Harrison Elementary School, Livingston Public Schools. Accessed November 14, 2018. ^ Hillside Elementary School, Livingston Public Schools. Accessed November 14, 2018. ^ Mount Pleasant Elementary School, Livingston Public Schools. Accessed November 14, 2018. ^ Riker Hill Elementary School, Livingston Public Schools. Accessed November 14, 2018. ^ Mount Pleasant Middle School, Livingston Public Schools. Accessed November 14, 2018. ^ Heritage Middle School, Livingston Public Schools. Accessed November 14, 2018. ^ Livingston High School, Livingston Public Schools. Accessed November 14, 2018. ^ Directory of Schools, Livingston Public Schools. Accessed November 14, 2018. ^ New Jersey School Directory for Livingston Public Schools, New Jersey Department of Education. Accessed December 29, 2016. ^ Blue Ribbon Schools Program: Schools Recognized 1982–1983 through 1999–2002 (PDF) Archived 2009-03-26 at the Wayback Machine, United States Department of Education. Accessed March 28, 2011. ^ "The Top New Jersey High Schools", New Jersey Monthly, August 13, 2012. Accessed July 17, 2014. ^ Livingston, New Jersey, City-Data. Accessed March 28, 2011. ^ Pursuing Water Conservation in Livingston, New Jersey, New Jersey Department of Environmental Protection, Office of Planning and Sustainable Communities, Accessed January 22, 2011. ^ Town Topics, Township of Livingston, Winter 2007–2008, p. 12. Accessed April 19, 2009. ^ Public Library (Public Use) Data Files, Institute of Museum and Library Services. Accessed April 19, 2009. ^ Essex County Catholic Elementary Schools, Roman Catholic Archdiocese of Newark. Accessed July 20, 2016. ^ About Us, Joseph Kushner Hebrew Academy / Rae Kushner Yeshiva High School. Accessed August 5, 2013. ^ Vision, The Tzedek School. Accessed December 7, 2011. ^ Quick Facts, Newark Academy. Accessed August 5, 2013. ^ Livingston Historical Society, Township of Livingston. Accessed August 5, 2013. ^ Livingston Master Plan: Section XI – Historic Preservation Plan Element, Livingston Township. Accessed August 16, 2009. ^ "Livingston Commuter Options Make "Summer from Hell" Commute Easier". TAP into. 27 July 2017. Retrieved 20 August 2017. ^ Essex County Bus / Rail Connections, NJ Transit, backed up by the internet Archive as of May 22, 2009. Accessed December 7, 2011. ^ , Livingston Express Shuttle. Accessed August 2, 2013. ^ Ifill, Gwen. "The 1992 Campaign: Democrats; Clinton Backs New Jersey's Changes in Welfare System", The New York Times, May 23, 1992. Accessed August 5, 2013. "The audience at Livingston High School, made up of students and women active in labor groups and advocacy organizations like the League of Women Voters and the National Organization for Women, began to applaud when Mr. Clinton said that he did not favor welfare revisions that would 'hurt the kids.'" ^ "Destinations; A Day for Olympic Torch To Glow in New Jersey", The New York Times, June 16, 1996. Accessed August 5, 2013. "The torch travels on a tight schedule. Here's when it is expected in various towns along the route Tuesday: Secaucus, 11:30 A.M.; Livingston, 2:20 P.M.; Morristown, 4 P.M.; Pluckemin, 5:40 P.M.; Hillsborough, 6:05 P.M. and Princeton, 6:30 P.M."
^ "Governor Advances Her Vision ofNew Jersey as Many Faces, But One Family;Takes Members of Cabinet on Road in Essex County", Governor of New Jersey press release dated November 16, 1999. Accessed August 25, 2014. "In the evening, the Governor delivered remarks and answered questions at a town meeting at Livingston High School." ^ Chen, David W. "No Lack of Curiosity, or Civility, at Corzine's First Forum on Toll Proposal", The New York Times, January 13, 2008. Accessed August 25, 2014. "But surprisingly, those were the exceptions rather than the rule on Saturday, when Mr. Corzine convened his first town hall meeting on his plan to drastically increase tolls in order to pay off billions of dollars in debt and maintain the state's bridges and highways. More than 900 people showed up for the meeting at Livingston High School, prompting organizers to use another room for overflow." ^ Moody, Chris; and Killough, Ashley. "Chris Christie launches 2016 presidential bid", CNN, June 30, 2015. Accessed July 8, 2015. ^ "Statement from the National Museum of American History: Collection of Materials from V.A. Shiva Ayyudurai", Smithsonian Institution, February 23, 2012. Accessed March 19, 2013. "On Feb. 16, the Smithsonian's National Museum of American History collected a selection of materials from Shiva Ayyadurai of MIT. In accepting these objects, the museum did not claim that Ayyadurai was 'the inventor of email,' as some press accounts have alleged.... The objects collected include: two program printouts, two tape cassettes, a reel of computer tape and a variety of other materials related to an electronic mail program Ayyadurai developed for the College of Medicine and Dentistry of New Jersey as a high school student at Livingston High School in Livingston, N.J., in 1979." ^ Three Scientists Elected to Top Academies, Lamont-Doherty Earth Observatory. Accessed April 15, 2009. ^ When Hearts Touch, Livingston Education Foundation, September 15, 2014. Accessed January 3, 2018. "In early September, through art and science, two hearts touched... neither aware that they had shared roots in the Township of Livingston. Dr. Suzanne Steinbaum, one of this year's Livingston High School Hall of Fame 2014 inductees (LHS class of 1986), participated on a Q and A panel for the American Heart Association- My Heart. My Life speaking to theatre-goers following an Off Broadway performance of Piece of My Heart." ^ Nicole Kresge, Robert D. Simoni, and Robert L. Hill. "The Chemistry of Fluorescent Indicators: the Work of Roger Y. Tsien", Journal of Biological Chemistry, September 15, 2006. Accessed September 18, 2007. "Born in New York, in 1952, Roger Yonchien Tsien grew up in Livingston, New Jersey." ^ Swayze, Bill. "Jersey teens call science a winner: Two finalists say just being in Westinghouse talent competition is prize enough", The Star-Ledger, March 11, 1997. Accessed September 18, 2007. "Only one New Jersey teenager has ever captured top honors in the history of the competition. That was Roger Tsien in 1968. The then-16-year-old Livingston High School math-science whiz explored the way subatomic particles act as bridges between two dissimilar metal atoms in various complex molecules." ^ Val Britton Biography, Artnet. Accessed May 27, 2016. "1977 – Born in Livingston, New Jersey"
^ Auletta, Ken. Annuals of Communications Redstone's Secret Weapon. Accessed February 24, 2011. "Frank Biondi grew up in a strict Catholic home in Livingston, New Jersey." ^ Hester, Tom Sr. "Christie names Richard Bagger, Robert E. Grady to chair a task force on New Jersey's fiscal challenges", NewJerseyNewsroom.com, November 12, 2009. Accessed February 24, 2011. "Christie named former Republican legislator Richard H. Bagger of Westfield, an executive at Pfizer Inc and a former chairman of the lower house's Appropriations Committee, and Robert E. Grady, a Livingston native, former aide to Gov. Thomas Kean and former top official at the White House Office of Management and Budget (OMB) as co-chairmen of the task force." ^ Goldstein, Richard. "Barry Halper, Baseball Memorabilia Collector, Dies at 66", The New York Times, December 20, 2005. Accessed February 24, 2011. "He once owned at least 80,000 baseball items, most having been displayed at his former home in Livingston, where a visitor pressing the front doorbell heard a rendition of 'Take Me Out to the Ballgame.'" ^ Sullivan, John. "Like an 'Abandoned Planet'", The New York Times, August 22, 2004. Accessed August 5, 2013. "There was the murmur of reporters and photographers trading the rumor of the moment, punctuated and fanned by cellphones ringing with tips – like the one on Tuesday that the United States attorney, up the Turnpike in Newark, was planning to announce a plea agreement involving Charles Kushner, a developer from Livingston who is one of the top Democratic contributors in the country." ^ Kelly, Mike. "Kushner proves rich not smarter than rest of us", The Record (Bergen County), July 14, 2004. Accessed March 10, 2013. "Kushner nodded slightly as his attorneys agreed to $5 million in bail secured by Kushner's home in Livingston and beach house in Elberon." ^ Staff. "Forbes Features Members of the Tribe In 30 Under 30", Jspace.com, December 29, 2011, backed up by the Internet Archive as of January 30, 2012. Accessed March 10, 2015. "Kushner grew up in a Jewish home in Livingston New Jersey and graduated from Harvard University." ^ "Seven-figure donation fuels emergency campaign", United Jewish Communities of MetroWest. Accessed February 24, 2011. "Chief among them is the gift of David Tepper of Livingston, who donated $1 million from the David A. Tepper Charitable Foundation. Tepper, a hedge-fund manager, made the pledge last month at a parlor meeting in the Short Hills home of Steven and Lori Klinghoffer." ^ Weinraub, Bernard. "At the Movies", The New York Times, October 22, 1999. Accessed August 5, 2013. "'I was born in 1959 and grew up in Livingston, N.J., but I felt I knew these people very well,' said Mr. Alexander (above)." ^ Staff. "Benjamin August's Film To Premier in New Jersey", West Essex Tribune, January 14, 2016. Accessed January 24, 2016. "Screenwriter Benjamin August, a 1997 graduate of Livingston High School, will discuss his film, Remember, at its New Jersey premiere on Saturday, February 6, at 7:30 p.m."
^ Kaplan, Ron. "WNBC anchor among MetroWest sports hall inductees, New Jersey Jewish News, June 19, 2008. Accessed February 24, 2011. ^ Weitzman, Yaron. "Sha Na Na Tova; Happy New Year from a doo-wop singer who opened for Jimi at Woodstock, then became a biblical scholar", Tablet (magazine), September 30, 2016. Accessed October 31, 2016. "Just before he turned 13, Cooper's family moved to Livingston, New Jersey." ^ Rose, Lisa. "Lady Gaga files lawsuit of her own against Rob Fusari", The Star-Ledger, March 20, 2010. Accessed February 24, 2011. "The 42-year-old Livingston native, who helped pen and produce such hits as 'Bootylicious' by Destiny's Child and 'Wild Wild West' by Will Smith, was singing a different tune during a taped interview with The Star-Ledger in January." ^ Kawashima, Dale. Rob Fusari Co-Writes & Produces Top Hits For Destiny's Child, Will Smith And Other Artists, SongWriterUniverse.com. Accessed February 24, 2011. ^ Salvatore, Drew Anne. "Bullied No More13-year-old Dana Gaier, of Livingston, voiced the character of Edith in the animated hit Despicable Me. ", New Jersey Monthly, September 13, 2011. Accessed February 15, 2016. "Yet back home in Livingston, few would have envied her. At Heritage Middle School, Gaier found herself on the receiving end of what is euphemistically called 'girl drama'—being picked on." ^ Shattuck, Kathryn. "Column: What's On Tonight", The New York Times, March 9, 2007. Accessed March 6, 2018. "10 P.M. (Comedy Central) Comedy Central Presents Chelsea Handler, the youngest of six children, was born in Livingston, N.J., to a Jewish father and a Mormon mother." ^ Michaud, Jon. "The Exchange: Music in the Streets and Underground", The New Yorker, June 3, 2011. Accessed October 9, 2011. "Heth and Jed Weinstein, busking brothers who have been performing on the streets and in the subways of New York City for years, have just published their first book. "Buskers: The On-the-Streets, In-the-Trains, Off-the-Grid-Memoir of Two New York City Street Musicians" was released in May by Soft Skull Press. The memoir, told in alternating chapters by Heth and Jed, chronicles their childhood in Livingston, New Jersey, their brief career as petty criminals, their early attempts to make it in the music business, and, finally, their success as street musicians." ^ Reich, Ronni. "Tony Awards 2011: Nikki M. James follows dream from church to Broadway", The Star-Ledger, June 12, 2011. Accessed November 28, 2012. "Nikki M. James has always known what it means to dream of paradise.From age 5, when she made her public singing debut at church, the Livingston native has pursued her goal of becoming one of Broadway's leading ladies with an unstoppable passion." ^ Wilkowe, Ellen S. "Things to do in Morris County, NJ: Last Comic Standing tour comes to Morristown, NJ, Jan. 15", Daily Record (Morristown), January 13, 2011. Accessed February 24, 2011. "One-time aspiring singer/songwriter Myq Kaplan, 32, formerly of Livingston and now of New York City, changed his tune ... and converted to comedy." ^ Gans, Andrew. "Diva Talk: Chatting with LuPone at Les Mouches's Leslie Kritzer Plus Rogers' Evita on Disc" Archived 2007-09-30 at the Wayback Machine, Playbill, September 22, 2006. Accessed February 24, 2011. "Kritzer: I was born in Manhattan, and I was raised in Livingston, New Jersey." ^ Lee, Michelle. "And The Award Goes To...; Sophia Lin, who grew up in Livingston, won an Independent Spirit Award. ", West Orange Patch, April 17, 2012. Accessed September 5, 2015. "Sophia Lin, who grew up in Livingston, knows this first-hand having toiled on 25 films and television shows over the span of 15 years.... Lin said she first became interested in the performing arts at Livingston High School while working behind the scenes on productions of Damn Yankees, Anything Goes and My Fair Lady." ^ Wong, Wayman. "The Leading Men: Brian's Song" Archived 2012-10-15 at the Wayback Machine, Playbill, February 1, 2005. Accessed February 24, 2011. "Born in Livingston, NJ, he started playing the piano at four, and was a punk rock kid who played in local bands and loved Alice Donut, the Lunachicks and Mudhoney." ^ Adam Pally Archived 2011-09-09 at the Wayback Machine, Upright Citizens Brigade Theatre. Accessed February 24, 2011. ^ Rosenzweig, Ilene. "Film; Welcome to the Awkward Age", The New York Times, May 26, 1996. Accessed August 25, 2014. "He himself is the product of an intact family in a neighborhood of split-level houses in suburban Livingston, in northern New Jersey." ^ "Governor's Awards in Arts Education Award Recipients May 2003", New Jersey Department of Education. Accessed May 23, 2016. ^ Township of Livingston Agenda Friday, January 1, 2010, Township of Livingston. Accessed June 1, 2010. ^ Hyman, Vicki. "Be Wendy Williams's neighbor: Livingston's Kean estate on market for $7.88M", NJ Advance Media for NJ.com, June 2, 2015. Accessed November 24, 2015. "What's the Hot Topic in Wendy Williams's Livingston neighborhood? The historic 30-room Kean estate that once took in more than 300 acres from the highest point in town is on the market for $7.88 million after an extensive renovation." ^ Santola, Danielle. "Donald Trump's Viral Twitter Feud with Livingston High School Graduate Danny Zuker Resurfaces", TAPinto.net, July 9, 2015. Accessed August 19, 2017. "Now that the wealthy businessman and American television personality Donald Trump has officially announced his presidential bid for the 2016 election, a Twitter feud between him and Livingston High School Class of 1982 graduate Danny Zuker is going viral for the second time in two years." ^ Colonel Glenn Rieth Confirmed As The Adjutant General, Military & Veterans Affairs, March 5, 2002. Accessed June 1, 2010. ^ a b Mona Charen and Ruth Marcus, C-SPAN Q&A (television), July 9, 2006 transcript. Accessed November 30, 2014. "Brian Lamb, C-SPAN: Ruth Marcus, can you remember the first time you met Mona Charen? Ruth Marcus, Author: I can't remember the first time but I can remember many other times in the middle there because we were – we both started in Livingston, New Jersey in fourth grade. We were both new to the school but we were in different classes, so I remember fifth grade on up." ^ Kennedy, Mark. "Talking With: Harlan Coben", Milwaukee Journal Sentinel, September 16, 2006. Accessed July 10, 2007. "Born in Newark and raised in Livingston, Coben is a Jersey boy through-and-through, having moved only to attend Amherst College in Massachusetts, where he met his wife, Anne, a pediatrician." ^ Moskin, Julia. "One Cook, Thousands of Seders", The New York Times, April 16, 2008. Accessed March 28, 2011. "'No corn, no grains, no legumes, no seeds — not even mustard or soy sauce for eight days,' she said, searing a rib roast as big as a bread machine in her kitchen in Livingston, N.J. 'It's quite challenging, as a cook.'" ^ Klein, Julia M. "Horn of Plenty: Short Hills Writer Dara Horn Explores Jewish Culture; A Jewish scholar and a Harvard PhD., novelist Dara Horn is also a happy suburban mom. ", New Jersey Monthly, August 14, 2013. Accessed May 27, 2018. "Younger sister Ariel, 33, an English teacher and novelist, resides in nearby Livingston with her husband and two children." ^ Hide and Seek Paperback, Amazon.com. Accessed September 5, 2015. "Jack Ketchum is the pseudonym for novelist Dallas Mayr. He was born in Livingston, New Jersey in 1946." ^ Wendy Mass, Hachette Book Group USA. Accessed January 14, 2012. "I grew up in Livingston, New Jersey, about 45 minutes from New York City." ^ "Ex-New Jersey Gov. Brendan Byrne, too ethical for mobsters, dies at 93". Chicago Tribune. January 4, 2018. Retrieved January 4, 2018. ^ via Associated Press. "Gov. Chris Christie heads home to Livingston to talk taxes", The Trentonian, December 8, 2010. Accessed February 24, 2011. ^ Lucille Day, Office of the Governor of New Jersey, backed up by the Internet Archive as of July 2, 2008. Accessed February 24, 2011. ^ Fowler, Glenn. "Nathan Jacobs, 83, an Ex-Justice Of the New Jersey Supreme Court", The New York Times, January 26, 1989. Accessed June 16, 2016. "Nathan L. Jacobs, a retired associate justice of the New Jersey Supreme Court and an influential figure in court reform in the state, died yesterday at his home in Livingston, N.J."
^ "Environmental Resource Inventory", Livingston Environmental Commission, July, 2010. Accessed August 25, 2011. "The Kean home is a Georgian–style bluestone mansion constructed by. Alexander Kean circa 1900 (Appendix D, Photo I). The house is located at 11 Chelsea Drive and was the longtime residence of Hamilton Kean US Congressman and brother of Alexander." ^ Cook, Joan. "Robert W. Kean, 86; Formerly In House; Jersey Republican Won Reputation as Expert on Social Security", The New York Times, September 24, 1980. Accessed February 24, 2011. "Robert Winthrop Kean, a former United States Representative and for years a leading figure in Republican politics in New Jersey, died Sunday in St. Barnabas Medical Center, Livingston, N.J., from a heart attack. He was 86 years old and lived in Livingston." ^ Sullivan, Joseph F. "Politics; Kean Set To Get 'Diploma' Tuesday", The New York Times, November 29, 1981. Accessed February 24, 2011. "Thomas H. Kean of Livingston, a former Assembly Speaker, is scheduled to get his diploma on Tuesday. That is when the state's Board of Canvassers meets in Trenton to certify the results of the Nov. 3 gubernatorial election." ^ Chen, David W. "A Kean on the Ballot? What Else Is New? ", The New York Times, September 16, 2006. Accessed February 24, 2011. "As he grew up at the family homestead in Livingston, the younger Mr. Kean said he was most impressed with the reception that his father received in the community." ^ Rosenfeld, Lucinda. "Jared Kushner’s Entitlement Is New Jersey Born and Bred", The New York Times, September 29, 2017. Accessed September 30, 2017. "While Mr. Kushner was raised in Livingston, an upper-middle-class town of 30,000 in neighboring Essex County, he attended school in Paramus, a middle-class town a dozen miles from the edge of Manhattan that, with its surfeit of malls, has long held the status of a punch line." ^ Representative Michael B. "Mike" Weinstein, Florida House of Representatives. Accessed February 24, 2011. ^ a b State of New Jersey biography for Nina Mitchell Wells, State of New Jersey, backed up by the Internet Archive as of December 31, 2007. Accessed February 24, 2011. "Secretary Wells and her husband, Ted Wells, Esq. reside in Livingston, NJ and have two grown children, Teresa and Phillip." ^ Zambito, Thomas. "Christie ally David Wildstein pleads guilty, says Bridgegate closures were retribution", NJ.com, May 1, 2015. Accessed September 28, 2016. ^ Jozy Altidore, ESPN. Accessed June 1, 2010. ^ Hirsch, Rod. "Immaculata Football Standout Begins NFL Career with Minnesota Vikings", TAPinto.net, September 3, 2017. Accessed November 5, 2017. "Standout Immaculata High School football player Tashawn Bower has played himself onto the opening day roster of the Minnesota Vikings after a four-year collegiate career at defensive end for perennial powerhouse LSU.... Bower's family lives in Livingston." ^ DeFaveri, Matt. "Chernoff steps up to the plate with the Indians; Assistant GM is member of the 'Tribe'", Cleveland Jewish News, June 28, 2012. Accessed May 27, 2016. "Chernoff grew up in Livingston, New Jersey, a town of about 27,000 people. His family belonged to Temple Emanu El, where he became a bar mitzvah." ^ Staff. "Women's 800 meters features a full field", The Philadelphia Inquirer, July 1, 2008. Accessed February 25, 2011. "Hazel Clark, a 2004 Olympian from Livingston, N.J., was the winner in 1 minute, 59.82 seconds." ^ Pairs Biography Andrea Davidovich / Evgeni Krasnopolski, International Skating Union. Accessed August 25, 2014. ^ Luicci, Tom. "Livingston's Bob Dukiet showcased special talents both on and off the court", The Star-Ledger, June 1, 2009. Accessed February 24, 2011. "This was back in 1965 when Cousy was the head basketball coach at Boston College and Dukiet was the Parade All-American guard from Livingston that every major program wanted." ^ Monica Flores - Notre Dame Women's Soccer, Notre Dame Fighting Irish women's soccer. Accessed November 26, 2017. "Hometown: Livingston, N.J.; High School: Livingston"
^ Rosen, Harvey. "Jewish players, owner score in pro football", Cleveland Jewish News, October 20, 2005. Accessed February 24, 2011. "The Livingston, N.J., native, who has his bachelor's degree in psychology, earned three letters in football, two in basketball, and three in track and field." ^ Williams, Lena. "Plus: Tennis – Exhibition; Gimelstob Starts Charity Event", The New York Times, December 16, 1998. Accessed August 5, 2013. "On Saturday, Gimelstob and three of his Davis Cup teammates – Todd Martin, Jim Courier and Jan-Michael Gambill – will take part in a one-day exhibition to benefit three charities: the Eastern Tennis Association, the Tim and Tom Gullikson Foundation, and the Valerie Fund at St. Barnabas Medical Center in Livingston, N.J. My brothers and I were born there, said Gimelstob, of the medical center." ^ Litsky, Frank. "The Seoul Olympics; Swimmer Outraces His Past", The New York Times, September 18, 1988. Accessed August 5, 2013. "At the age of 12, Chris Jacobs of Livingston, N.J., tried cocaine for the first time." ^ Bondy, Filip. "Nerd Power Taken Lightly, Rowers Delight In Silver Medal", New York Daily News, July 29, 1996. "Jamieson, from Livingston, N.J., was in the quadruple scull that rowed second behind Germany to take the first United States medal ever in that event." ^ Gambaccini, Peter. Eulogy for Sheldon Karlin, NY Runner, March / April 2000, at Central Park Track Club. Accessed January 8, 2018. "Karlin, only 49, died while walking near his home in Livingston, New Jersey, on January 16. He was known to have arteriosclerosis, and had suffered a mild heart attack in December." ^ Dan Kellner, Sports Reference. Accessed August 21, 2018. "Born: April 16, 1976 (Age 42.127, YY.DDD) in Livingston, New Jersey, United States"
^ Brandin Knight, Pittsburgh Panthers men's basketball. Accessed February 24, 2011. "Brandin Adar Knight was born Dec. 16, 1981 in Livingston, NJ...is the son of Mel and Brenda Knight." ^ Staff. "Utah Jazz Acquires Brevin Knight from L.A. Clippers", Utah Jazz, July 23, 2008. Accessed February 24, 2011. "A native of Livingston, N.J., Knight attended Seton Hall Prep in East Orange, N.J., before playing four seasons at Stanford University (1993–97), where he was a First Team All-American as a senior and won the 1997 Frances Pomeroy Naismith Award as the nation's most outstanding senior male collegian under six feet tall." ^ Brevin Knight, Yahoo! Sports. Accessed June 1, 2010. ^ Hague, Kim. "Without Marquez, Red Bulls lose again, this time, 4–1 to D.C. United", Daily Harrison, April 22, 2012. Accessed July 18, 2012. "The team started rookie Connor Lade, the Livingston, N.J. native, among the backs and Lade made two costly mistakes that directly led to first half goals." ^ Brendan Mahon, Penn State Nittany Lions football. Accessed October 4, 2018. "Born January 17, 1995 in Livingston, New Jersey." ^ Staff. "Nisenson of Hofstra Hits 2,009 Points, But L.I.U. Is Victor", The New York Times, February 5, 1965. Accessed August 12, 2011. "Steve Nisenson, a 6-foot-2-inch (1.88 m) senior from Livingston, N.J., became tonight the third college basketball player in the metropolitan area to score more than 2,000 points." ^ Staff. "Larry Ogunjobi (Ragsdale High School) will play in college football's Reece's Senior Bowl this Saturday in Mobile, Alabama", Greensboro Sports, January 25, 2017. Accessed May 11, 2017. "Mercy and Larry Ogunjobi Sr. weren't afforded such an opportunity. A year after following her husband from Nigeria to the United States, Mercy found herself in a Livingston, N.J., hospital, giving birth to the couple's first child." ^ Varsallone, Jim. "Mae Young Classic alternate Purrazzo helps lead ROH Women of Honor", Miami Herald, August 25, 2017. Accessed August 21, 2018. "Born in Livingston and raised in Jefferson, New Jersey, Purrazzo is also attractive and vied for the title of Miss New Jersey USA." ^ Trecker, Jerry. "World Cup '94 Making A Quick Point Newcomers, one local, help USA over Norway", Newsday, January 16, 1994. Accessed February 24, 2011. "Chasing down a long throw from former Blau-Weiss Gottschee star Dario Brose, [Claudio Reyna], the 1993 College Player of the Year from the University of Virginia and Livingston, N.J., slammed a hard shot at Norway goalkeeper Frode Grodas to create a game-winning rebound chance for Cobi Jones as the United States defeated Norway, 2–1, in Sun Devil Stadium yesterday to begin its 1994 World Cup preparation with an upset triumph." ^ Former U.S. Men's National Team Captain Claudio Reyna Named U.S. Soccer Youth Technical Director, United States Soccer Federation, April 7, 2010. Accessed June 1, 2010. ^ "Livingston's Frank Schwindel had monster season for Royals' affiliates". Diamond Nation. Retrieved August 19, 2018. ^ Bondy, Filip. "Visitors Are Feeling Right At Home In Jersey", New York Daily News, May 25, 2003. "'I've learned everything I need to know about New Jersey,' said Scott, who resides in Livingston during the season. 'You take 280 to the 'Pike to the arena.'" ^ Dillon, Dennis. "The miracles in David Tyree's grasp" Archived 2013-10-19 at the Wayback Machine, Sporting News, June 19, 2008. Accessed February 24, 2011. "Born in Livingston, N.J., Tyree had something of a hardscrabble life. He was 1 when his parents, Jesse and Thelma, divorced. When he was 10, Thelma moved Tyree and his two older sisters to Montclair, where they lived in a one-bedroom house. Thelma slept in the bedroom, David had the living room and his sisters took the dining room." ^ Porter, David L. Biographical dictionary of American sports: 1992–1995 supplement for baseball, football, basketball, and other sports, p. 237. Greenwood Publishing Group, 1995. ISBN 0-313-28431-8. Accessed February 24, 2011. "His family resided in Livingston, NJ, until he was age 14 and then moved to Parsippany, NJ." ^ Laurence, Charles. "Savagery, greed and a life of crime – meet the real Sopranos", Daily Mail, May 7, 2007. Accessed February 24, 2011. "The Boot built a mansion in Livingston, described by one who saw it, as a 'Transylvanian classic', because of its turrets and out-of-place appearance in the New Jersey suburbs." Wikimedia Commons has media related to Livingston, New Jersey.